Franklin County Chamber of Commerce - Welcome! 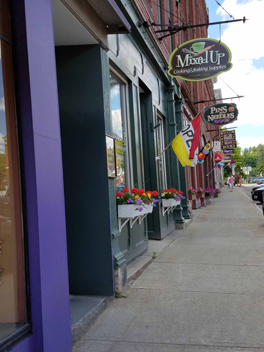 Franklin County, Maine is a unique blend of sophisticated culture and laid-back charm amidst natural beauty. Have you ever wanted to stroll down a vibrant downtown area while visiting local galleries, unique shops and eateries and within the same mile be able to walk down beautiful trails within miles of tranquil forest? How about hike a glacial rock formation and ride a train on a track that's more than a hundred years old, all within the same day? With our many pristine lakes and breathtaking mountains, it's not hard to explore or discover your favorite outdoor experience. Eat at one of the many restaurants. Shop in the unique local shops. Enjoy one of the many festivals, concerts or events. Explore the area's history in a local museum or historical society. Extend your stay by spending a night. Tractor Supply Company is the largest operator of rural lifestyle retail stores in America. Founded in 1938 as a mail order tractor parts business, Tractor Supply Company (also referred to as TSC) owns and operates over 1,700 stores in 49 states supplying basic maintenance products to home, land, pet and animal owners. Based in Brentwood, Tenn., Tractor Supply is a public company whose stock is traded on The NASDAQ National Market under the symbol TSCO. The company was founded in 1938 as a mail order catalog business offering tractor parts to America's family farmers. Today Tractor Supply is a leading edge retailer with annual revenues of approximately $7.26 billion. Tractor Supply is continuing to grow with new stores and improved product offerings. The Tractor Supply mission and values motivate and inspire team members and give the organization a unified focus for the future. Hair Salon that provides 7+ hair services, including but not limited to coloring, balayage, foiling, special occasion hair, cutting, and smoothing/straghtening. Hot Heads Extension certified. Cooking and baking supplies shop in Farmington that offers Stonewall Kitchen, FIORE Artisan Olive Oils and vinegars, candy making supplies, kitchen linens, cookware, electrics and so much more! Dedicated to preserving traditional use for the High Peaks Region of Western Maine. Flagstaff Area Business Association (FABA) is dedicated to promoting the beauty, adventure, and endless possibilities of the Maine's High Peaks Region! Small town local hardware store providing outstanding service and featuring quality products. A convenience store in Jay offering a variety of beverages and food, fresh pizza, sandwiches and more.